It establishes in our hearts and the hearts of others that this endeavor is bigger than any individual and must be accomplished by God through multiple means. It allows other people who aren’t going on the trip to be involved in the ministry and receive a huge blessing. In 1 Corinthians 3:6, Paul spoke of what he could do, what Apollos could do and then what only God could do. It provides an opportunity for others to show their belief in you and bless you. Why have you have decided to go on a mission trip? Each person has a unique story behind what has led them to participate in this opportunity. Share that story. Tell people why you’re going on this trip and let them know how their contribution will help you accomplish God’s purposes and plans. One fundraising website claims that campaigns on their site that contain pictures receive six times more donations than those without pictures. Include some pictures of yourself and/or the people and place you will be serving to help bring your story to life! Details about the campaign –place, date, purpose, etc. Close with final comments and signature. Hand addressing the mailing envelope adds a personal touch. Include a self-addressed, pre-stamped envelope with support letter. The last step of your online application will require you to set up a Personal Headquarters/Fundraising Page that can be linked to Facebook and Twitter. This page can be used to tell all your friends about your upcoming trip, keep them updated on your financial progress and prayer requests, and receive financial support for your trip. This will help you know your support-status and keep your supporters informed of your progress through social networking! Verify that your name and Trip Code are on the memo line so we can credit the right account. *It is best to send a note within one week of receiving their gift. This is important because it allows the supporter to see how God blessed their prayer and financial gift. It also gives them an opportunity to continue in the ministry by praying for you and those to whom you ministered. Stories of encounters you had in sharing the gospel and discipling individuals, interesting and funny things that happened, etc. SAMPLEClick here to see a sample newsletter. At NEXT Worldwide we believe God has entrusted us with His resources and challenged us to be good stewards. These guidelines are designed to ensure good stewardship and help provide each participant with the best overall experience possible. Initial Trip Deposit: Your trip deposit is non-refundable. Deposits may be transferred to another participant until the Travel Cost Deadline. After this date, the deposit becomes non-transferrable. All Donations are Non-Refundable: As a 501c3 non-pro t organization, all funds obtained for NEXT Worldwide mission trips are considered unrestricted charitable contributions receiving a tax deduction and therefore, the property of NEXT Worldwide for federal income tax purposes. Payment Deadlines Must be Met: If payment deadlines are not met, the participant may be subject to an increase in trip cost or a trip cancellation. Trip Cost: The cost of each trip includes airfare, lodging, in-country food and transportation, translators, evangelism and leadership materials, funds for the new church-plant, funds for the church- planting partner, church-planting resources and trip costs for two NEXT sta members. Airline Tickets: Once an airline ticket has been purchased, the cost to cover the designated ticket is non-refundable and non-transferrable. Factors Beyond our Control: Certain elements like the cost of airline tickets, fuel surcharges, country taxes and fluctuations in the value of the US dollar, etc. are beyond our control. We strive to provide the most accurate and cost efficient trip price, but uctuating costs may cause trip prices to change. While rare, NEXT Worldwide also reserves the right to adjust prices, change the location of or cancel a trip when warranted by circumstances beyond the control of the organization. A NEXT Worldwide trip participant may be allowed to use his/her account balance, (minus deposit and airfare charged to that point) towards another NEXT Worldwide trip in the following calendar year. If the participant is unable to go on another trip in the next year, the participant may designate the transfer of funds (minus deposit and airfare charged up to that point) to another trip participant on that same trip or the participant’s account balance will go to further the mission of NEXT Worldwide. If funds are transferred to a new person after the Travel Cost Due Date, that trip’s deposit amount will be required by the new person before the departure date. NEXT reserves the right to change the location of or cancel a trip when deemed necessary by the NEXT Worldwide leadership. E-Book Click here for an e-book with fundraising tips and ideas from Group. Other Ideas Click here for a list of 70 fundraising ideas from Group. FUND THE NATIONS Click here to check out Fund The Nations. They print t-shirts you can sell to help fund your trip. .pdf Support Click here to download a .pdf version of our sample support letter. .doc Support Click here to download an editable .doc version of our sample support letter. 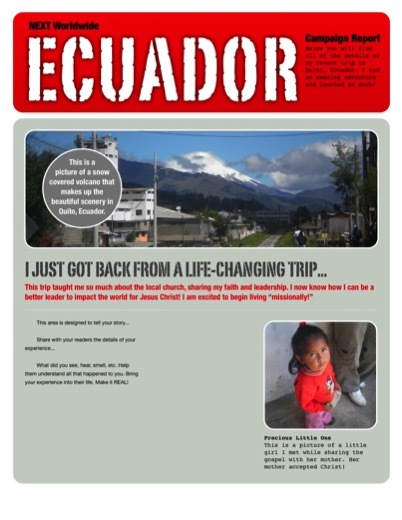 NEWSLETTER Click here to view a sample newsletter for use after you return from your trip. SUPPORT TRACKER Click here to download an excel spreadsheet to help you keep track of your supporters.